The uploaded file could not be moved to wp-content/uploads/2015/06 . 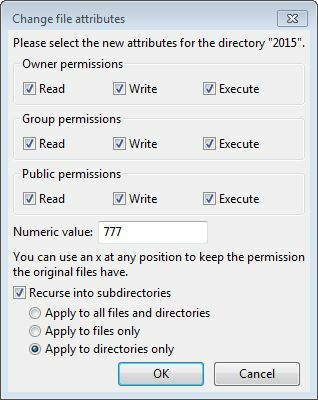 I went to my FTP and changed the file permissions of my wp-content from 755 to 777. This change allowed me to upload pictures from my IOS app and from the web. Then when done, i went and changed it back to 755 for security reasons. I know absolutely nothing about FTP’s but I am having the same problem. Can you explain to me how I find my FTP? If your refering to ftp settings, then those are going to be given to you by your admin, or by the one who creates your account. You can just look on google for filezilla its a most common ftp program out there, make sure its the client not the server version. After you have your ftp settings you can simply login to ur webserver with those settings using filezilla and make the changes that i did. You should change your folders permissions like in the example shown above.